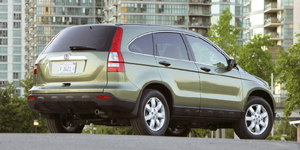 Like many Honda products past and present, the 2009 Honda CR-V is a top seller because it just makes sense. Safety? Check. Crash test scores don't get any better than the CR-V's. Versatility? Check. Maximum cargo capacity is a substantial 73 cubic feet of space, and there are numerous nooks and crannies in which to stash your stuff. Comfort and convenience? Check. The driving position is close to ideal, the controls are idiot-proof and the spacious rear seat both reclines and slides fore and aft. Secure handling? Check. In fact, the CR-V's communicative steering makes it downright entertaining to drive. The 2009 Honda CR-V SUV is powered by a 2.4-liter Inline-4 with 166 hp.